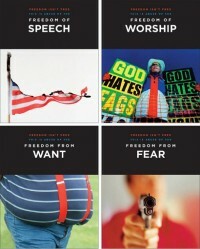 THE FOUR FREEDOMS? : Corruption rules modern America. It is a truism, mentioned by Mike Gravel among many others, that both parties and their candidates take in considerable sums of money from hedge funds, oil companies, lawyers’ associations, and numerous multinational corporations — to say nothing of the Israel Lobby. But it’s nothing new. A (much older) friend of mine, who worked for Army intelligence during World War 2, once told me that many Washington insiders routinely referred to FDR’s “Four Freedoms” as “The Rake Off, the Pay Off, the Shakedown, and the Fix.” And so it goes.